Nick Taylor finds Hans-Werner Sinn‘s book to be an excellent point of reference for understanding the economic trends leading up to 2007, but senses the author’s tensions around opportunities for structural reform. Casino Capitalism: How the Financial Crisis Came About and What Needs to be Done Now. By Hans-Werner Sinn. Oxford University Press. August 2010. Hans-Werner Sinn’s book on the financial crisis comes at a time when new regulatory rules and bodies are struggling to provide a solution to a global banking problem. In particular Basel III, the third wave of regulations dealing with capital and liquidity requirements for banks, should be implemented by the G20 nations by the end of this year. In the UK the government has just published its own regulatory response to the crisis, including a new ‘financial services watchdog’ to replace the beleaguered Financial Services Authority (FSA). The coalition’s austerity programme is about to step up a gear in the face of growing public resistance and even the unlikely radical, Bank of England Governor Mervyn King, is urging us to remember the excesses of the banking world as it does so. 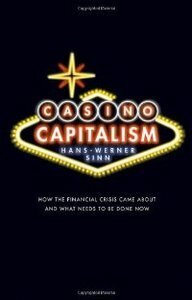 Sinn’s book, Casino Capitalism, is a comprehensive look at, as its subtitle suggests, ‘how the financial crisis came about’ and, just as importantly, ‘what needs to be done now’. A renowned German economist and President of the Munich-based Ifo Institute of Economic Research, he provides a valuable commentary from outside of the Anglo-Saxon bubble. The book covers in meticulous detail the macro- and micro-economic developments that led to the crisis and provides a blow-by-blow account of bank failures across the globe. The casino analogy is now well-worn in common perceptions of the crisis: investment bankers gambled with the general public’s money, lost almost everything, and left the receipt with the government. Sinn’s argument is that limited liability was the basis for the kind of financial gambling that went on prior to the 2007-8 crisis. Because banks were only liable for the tiny proportion of capital they were holding, an environment was created which rationalized risk-taking strategies by ‘privatizing profits and socializing losses’. For individual banks it was a rational strategy – known as the ‘Bloos Rule’ – to engage in risky financial instruments while keeping minimal capital. In the unlikely event of global crisis the lender-of-last-resort, that is the taxpayer, would foot the bill. He also maintains, more controversially, that US homeowners gambled with their debts because of the non-recourse nature of their mortgages. Any book on the financial crisis has to be judged as much by the solutions it offers as by the explanations it makes for the causes. Sinn’s primary suggestion, unsurprisingly, is to increase capital requirements for banks, thus increasing their liability and dis-incentivizing gambling. He also reviews common proposals for dealing with the crisis and its aftermath such as the creation of bad or ‘toxic’ banks, reforming accountancy rules and the ratings agencies, banning the destructive practice of ‘short selling’ and separating retail and investment banking. In a bid to find the best strategy he looks at what has already been done in the US, UK, Germany and elsewhere. His ‘ordoliberal’ ideology and economist’s concern for market efficiency lead him to settle on a policy where government plays a strictly limited role in ‘hospitalizing’ banks before withdrawing to a distance. Casino Capitalism is very much an economist’s attempt to describe for a wider audience what they see in the crisis. In this regard it can be judged a success: it is an excellent point of reference for understanding the economic trends leading up to 2007 and beyond and provides a wealth of information at a relatively accessible level. There is, however, a tension that sits at the heart of the book. Sinn is clearly uneasy about the state’s role in rescue and recovery during and after the crisis. His ideological position tells him that the state is there only to create the rules of the game and not meddle in areas where the market can supposedly operate more efficiently. In this regard he shows something approaching disdain for the policy of forced mortgage-provision for the poor enacted through Fannie Mae and Freddie Mac in the US. On the other hand, he clearly abhors the ‘moral hazard’ aspect of taxpayers bailing out financial institutions. Though the book is extraordinarily comprehensive in scope, covering causes and solutions with equal rigour, it leaves the reader wondering whether the crisis presents more of an opportunity for governments, and for greater structural reform, than Sinn would approve. This review was originally published on the British Politics and Policy at LSE blog on 20th March 2011. Nick Taylor is a PhD candidate in the Politics and International Studies at the University of Warwick. His research focuses on classical political economy and its contemporary relevance to issues of labour and welfare. He holds a BA in International Relations from the University of Sussex and two MAs from the University of Warwick, in International Political Economy and in Politics. Nick tweets @KafkanDream and more information is available on his Warwick research profile. Read more reviews by Nick.